In the Linked Earth context, a working group (WG) is a self-organized coalition of knowledgeable experts, whose activities are governed herewith. 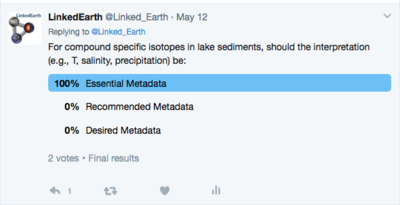 This page is dedicated to the discussion of data and metadata standards for lake sediments (see this page for a definition of the lake sediment archive), and aims to formulate a set of recommendations for such a standard. Note that chronological aspects should be discussed within the Chronologies WG. This working group has 15 members. Thinking about data standards for lakes is a challenging task because of the incredible diversity of observations made on this archive. To start this process, the working group will focus on developing standards for the one variable in lake sediments that all scientists rely on: depth. After we've done this process for depth, I suggest we reach out and broaden this group to include broad expertise of different sensor and observations types. A preliminary list is presented below. How should we report depth? provide an ideal data table for each type of observation, so the community knows what to report and how to report it. In the case of tilted or deformed sedimentary units (for instance due to coring operations), core depths should be read at the center of the core, and information regarding the width of the subsample should be reported. 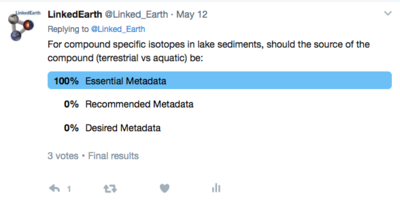 There were 10 votes since the poll was created on 12:18, 21 September 2016.
and ideally, we want to store the necessary information that describes the relationship between core depth and composite depth. LacCore (and others) use splice and affine tables to accomplish that. Add a description and discussion of splice and affine tables for discussion here. For both core depth and composite depth, we need a datum for depth. Most typically, this is the top of the sediment in each core, for core depth (where depth=0), and is the sediment surface for composite depths. Sometimes, depth from the lake (water) surface is used. There were 0 votes since the poll was created on 09:59, 17 September 2017. There were 0 votes since the poll was created on 09:56, 17 September 2017. There were 0 votes since the poll was created on 09:58, 17 September 2017. There were 0 votes since the poll was created on 10:00, 17 September 2017. There were 0 votes since the poll was created on 10:14, 17 September 2017. There were 0 votes since the poll was created on 10:15, 17 September 2017. There were 0 votes since the poll was created on 10:16, 17 September 2017. There were 0 votes since the poll was created on 10:17, 17 September 2017. There were 0 votes since the poll was created on 10:43, 18 September 2017. There were 0 votes since the poll was created on 10:44, 18 September 2017. There were 0 votes since the poll was created on 07:49, 18 September 2017. There were 0 votes since the poll was created on 07:50, 18 September 2017. There were 0 votes since the poll was created on 07:51, 18 September 2017. There were 0 votes since the poll was created on 07:52, 18 September 2017. There were 0 votes since the poll was created on 07:53, 18 September 2017. There were 0 votes since the poll was created on 07:54, 18 September 2017. There was one vote since the poll was created on 10:31, 9 May 2017. There was one vote since the poll was created on 10:32, 9 May 2017. There were 0 votes since the poll was created on 11:19, 18 September 2017. There were 0 votes since the poll was created on 11:20, 18 September 2017. This page was last modified on 18 September 2017, at 11:20.